Morgan Woodward has be come an icon to hundreds of future Clemson Football hopefuls. After walking on to the Clemson Football team in 1998, he has become a starter on a top-20 football team. He has shown that hard work and dedication do pay off, literally. Last year, when he moved into the starting lineup, he was rewarded with a scholarship. Woodward is a senior chemical engineering major from Florence, SC, the only chemical engineer on the Clemson football team. He plans on graduating in May and going on to the Medical University of South Carolina. “I really love children, I would like to be a pediatrician and help kids get well when they are sick,” said Woodward. An undergraduate degree in engineering combined with a medical degree is an usual combination. Overcoming odds to record landmark achievements comes from the encouragement he receives from his family. The leadership from the family dates back to his youth and on through his high school years. He originally decided to go to West Point, but changed his mind late in the process and came to Clemson. His father, Patton, comes to call the Clemson games, even though he lives in North Carolina during the week for his work. Clemson football is a family event. Woodward’s sister, attends South Carolina, but loves to cheer for her brother and the Clemson team. “Claire is disappointed that she only has one year left to cheer for the Tigers,” added Woodward. In high school, Woodward was a multi-purpose player, seeing time as a linebacker, fullback and punter. He played four years of football at South Florence High School, where he was named MVP of the team in 1996. He split that season from a position standpoint, playing seven games at linebacker and four at fullback. In the seven games as a linebacker he registered 95 tackles, then had more than 300 yards rushing as the fullback. Additionally, he averaged 41 yards per punt. That was not the only sport he excelled in. Woodward was the goal keeper on the soccer team and was named MVP of that squad, an example of his overall agility and athleticism. After enrolling at Clemson he was moved to the other side of the ball. 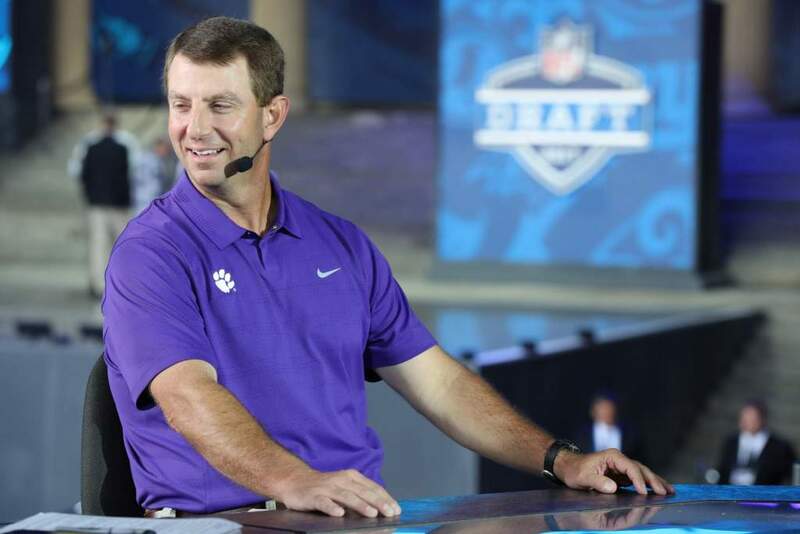 He came to Clemson after his high school coach, Mike Watts, father of former teammate and current graduate assistant coach Justin Watts, and Rick Stockstill encouraged him to join the team as a walkon. This love for Clemson football has helped him stick with the sport from the scout team practices to scoring touchdowns in front of thousands of fans. Since Coach Scott became the offensive coordinator last December, he now overseas the entire offense, not just the tight ends. Woodward has had to step up and become a leader and sometimes teacher to the younger tight ends. “I now have to help Ben (Hall) and Todd (McClinton) during practice by showing them the steps and answering their questions. I like the new responsibility and role as a leader.” Both Hall and McClinton were top 100 players coming out of high school and many expect them to replace Woodward in the starting lineup. But, even with an injury in the preseason, Woodward still holds down the starting slot because of his overall knowledge of the offense and his support to team chemistry. After Jason LeMay and Pat Cyrgalis left the team last year, Woodward was moved into the starting tight end slot. Although he is smaller than the average tight end, at six feet and 235 pounds, he has made a definite impact on the Clemson offense. That includes blocking. His goal line block on Missouri’s Justin Smith, a first-round NFL draft pick last year, was one of the most memorable blocks on a scoring play by a Clemson player in 2000. Woodward has a unique pre-game ritual. He always eats black-eyed peas during the team meal for good luck. “If someone does not have any on their plate, I will give them one of mine for good luck. I also like to listen to music before we go out on the field to help calm my nerves and focus my attention on the game,” added Woodward. 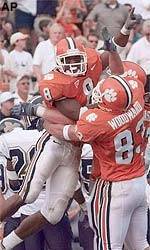 Woodward is an inspiration to all future Clemson walk-ons. So what is the secret to his success? Marsha Byers, a senior from Pickens, SC, is a student assistant in the Clemson Sports Information Office.